Welcome to Tremont Dental, check out our video to see how we do things a little differently here at our practice. We strive to create a comfortable, low pressure environment for providing quality dental care for you, your friends, and family. Please feel free to explore and like our Facebook, Google plus, or any of the links on our site. Thank you for visiting! Bring your family to Tremont Dental where they will receive quality dental care in a comfortable and family-friendly setting. You can count on a gorgeous smile with exceptional cosmetic dentistry and cost-effective services, including interest-free payments. Give your child a head start on a lifetime of healthy teeth with routine cleaning and exams, sealants, fillings and oral hygiene. Get started by calling the locally-owned practice at Tremont Dental to schedule your appointment. Patients of all ages are welcome. Dr. Bernard Bruns is a Northlander, growing up in Clay County and now residing in Kansas City. Dr Bruns ‘set up shop’ north of the river, in the area he grew up in near North Kansas City, Riverside, Parkville, and Gladstone. Purchasing from Dr David Van Tasell and continuing his tradition of quality, affordable dental care. He received his Doctor of Dental Surgery Degree from University of Missouri-Kansas City School of Dentistry just a few blocks from where he was born and from where his parents met. He has been married for 21 years and he and his wife have 6 children. Dr. Bruns is a proud supporter of the Royals, Chiefs, and all Northland sports activities. 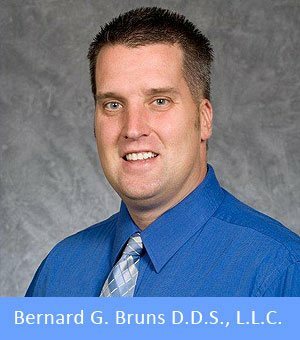 Dr. Bruns has been in the field for many years and enjoys keeping our office on the forefront of dentistry. By combining our experience, time tested dentistry practices, and today’s most modern advancements we are able to provide our ‘friends of the office’ top quality dental care. With digital imaging, “clear braces” by MTM clear aligner, Invisalign and Clear Correct, and of course our knowledgeable and friendly staff we provide a family-style, comfortable environment to help make your visits to our office enjoyable. Dr. Bruns has been recognized by his peers as a top dentist in the field of dentistry. Perhaps you’ve heard about the quality of our dental care from a friend, family member, or colleague. Our patients rely on us to improve and maintain their oral health; references and testimonials are available upon request.